Ramen DANBO is coming to Brooklyn, New York! Ramen DANBO is coming to Seattle! Curry Tonkotsu Ramen! A DANBO original, available for a limited time only. When flavors from Japan meet the spices of India, amazing things happen. 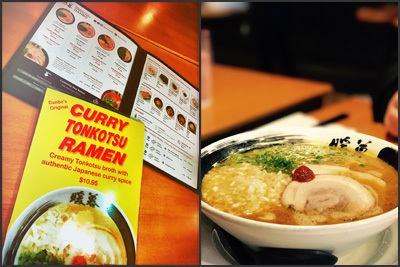 Our chefs have created an original recipe, and we’re the first to bring Curry Tonkotsu Ramen to North America. We recommend that you combine your ramen with a bowl of white rice for a truly satisfying taste experience. Come in today and try it! Limited quantities will be served each day, and for a limited time only. Please note: We’re unable to accept table reservations. Ramen is not available as a to-go item. Copyright ©2019 Ramen DANBO, Heart Connection Inc. All Rights Reserved. By continuing to browse this site or choosing to close this message, you give consent for cookies to be used.